Which Mario Game Is His Creator's Favourite? 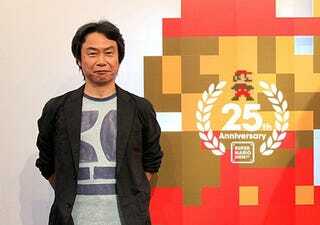 Legendary Nintendo designer Shigeru Miyamoto created Mario, having some part in most of the plumber's games to date. But after nearly thirty years of Mario, then, do you ever wonder which game is Miyamoto's favourite? It's not Mario 64. Not Mario Galaxy, either, and it's certainly not the original Super Mario Bros. Instead, it's 1990's Super Mario World for the Super Nintendo. And for a rather unexpected reason. "Super Mario World (1990) is something that included of course all the action you saw in Super Mario Bros. but it also had the map features, so it also had that element of players having to think about where they were going and what they were going to do next", Miyamoto tells USA Today. But the kicker? "I also think that it is a game that developed a large number of staff people who became producers and directors." Kind of a disappointing, company-man-esque response for a guy whose brain has been responsible for some of the best games ever made!